This newly designed book covers all native and introduced fishes found from the headwaters of the Bay to its entrance at the Atlantic Ocean. 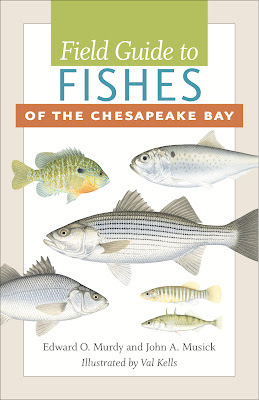 Compact and current, this is the most comprehensive guide to fishes of the Chesapeake Bay. Detailed descriptions include information about habitat, range, characteristics, and importance to fisheries. Meticulously researched and life-like illustrations accompany each description. Written and illustrated by experts, this book is bound to become an invaluable guide for Bay fishermen, scientists, researchers, students, naturalists, and conservationists alike. Available now online. Please browse the links above to learn more. Tight lines! -- Ed, Jack, and Val.